"There is something strange in our skies, and its closer than you think!" 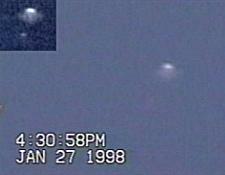 "The Rose Park UFO Footage is Spectacular ! We Were All Impressed"
On Sunday nights broadcast they showed video clips of the 98' Rose Park UFO' & the '97 Capital Reef UFO's' & talked about UUFOH & their activities in Utah. 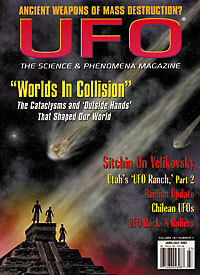 Published one of our 2003 Ranch Recon Photos "The Mystery Light"
Listed in UFO Magazines Webwatch as Second Place Winner! "The Utah UFO Hunters The New Search Group at www.aliendave.com is a small but growing Salt Lake City- based group dedicated to investigating and finding evidence of UFO activity and paranormal happenings in Utah. Their well-organized website makes it easy to follow their work." Bringing up some interesting questions and views such as the Strange Creature photo & the Firefly issue. as well as the Cat Mutilations, Chemtrails & Bigfoot Investigations. Join Whitley as he interviews two intrepid explorers from Ranch Recon 2003 who have made an unofficial visit to the area of the National Institute for Discovery Science's famous Sherman Ranch, called 'the strangest place on earth.' And be sure to take a look at the bizarre creature photographed there--very similar to the one Dr. John Alexander talks about in his interview on this site. Now, we talk to two independent investigators who have combed the same area armed with cameras and a lot of courage. What happens when ordinary folks, not bound by any allegiance to NIDS take a walk up that way? You could be looking at one of the results. They didn't even see the small animal in this photo when they took it. Is it similar to the ones seen by official visitors to the ranch? Want to join the speculation about the strange animal on Dave's website? Chuck & Alexia Cirino - producer and composer of horror and Sci Fi films. Whitley Streiber's Dreamland online show during Linda's report on the mysterious squash seeds. Ryan Layton is also mentioned in her report and was her original contact.